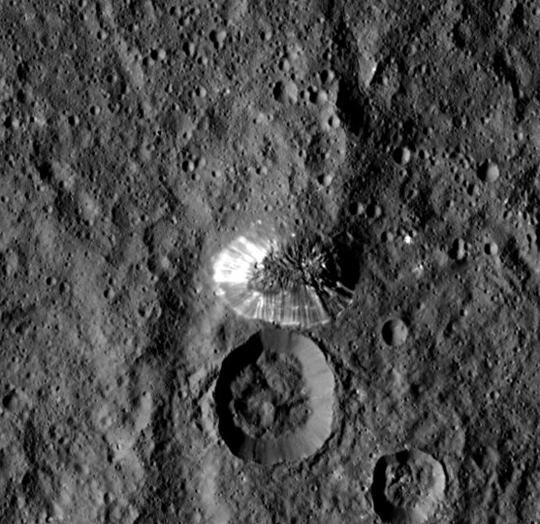 Part 2: What Force On Dwarf Planet Ceres Could Push Up A 4-Mile Shiny, Grooved Mountain? This July 2015 image was taken from 2,700 miles altitude in which the vertical relief was exaggerated by a factor of 5 generated by NASA to better highlight topography and subtle features. These intriguing Ceres bright spots are in a crater named Occator, which is about 60 miles (90 km) across and 2 miles (4 km) deep. Credits: NASA/JPL-Caltech/UCLA/MPS/DLR/IDA/LPI. 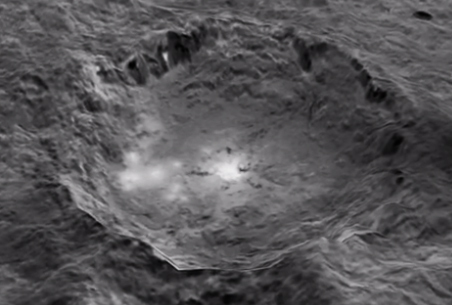 September 4, 2015 - Los Angeles, California- Part 2 continues the interview with Dawn Mission's Principal Investigator Christopher Russell, Ph.D., Professor of Geophysics and Space Physics, University of California-Los Angeles (UCLA), about the unique and singular 4-mile-high shiny, grooved mountain in the Ceres Southern Hemisphere that is an estimated 250 miles (400 km) from the Occator crater with the mysterious bright spots in the Northern Hemisphere. Previous PostPrevious Part 1: Where Are New Images of “Bright Spots” On Ceres from Lower 915-Mile-Orbit?